→This Time is Different Part 2: What Bitcoin Really Is. To me and many others, bitcoin is not a technical revolution as much as it is a triumph of political and economic incentives. Money is one of those “aquarium characteristics” of life. Aside from worrying about our bills or investments, the general structure of “money” is a background medium that underpins everything and for the most part we don’t really pay attention to it. Other examples are the base utilities like electricity and running water. What we are experiencing today is a technological innovation that is moving the nature of money itself from one form to the next and that is something that has only happened a few times throughout recorded history. It is because we are talking about a fundamental restructuring of the nature of money, and not an asset bubble occurring within the confines of the prevailing monetary system, that we can apply the “This time is different” label to Bitcoin. Centralized, opaque, debt-based, money is being disrupted by decentralized, open source, competitive crypto-currencies. This disruption has occurred out of necessity, given the irreparable harm central bank policies have inflicted on the citizenry over the last century, reaching what can only be considered a crack-up crescendo of targeted inflation, QEternity, ZIRP and NIRP, the war on cash and capital controls over the last 10 years. The most fitting label for all this is Chris Martenson’s “financial repression”. But as mentioned in Part 1: Bitcoin is not a debt based bubble. Leverage doesn’t account for the majority of the price action, at least not yet. As I write this, CBOE futures went live this week. Also, most exchanges are offering margin and a lot of traders are dumb enough to try using it, but that is not the driving factor pushing Bitcoin adoption. These emerging stories of people mortgaging their homes to buy bitcoin are “newsworthy”, and thus still sporadic. Debt would be a driving force of the bubble when it’s systemic. Looking at Bitcoin as a technology shift, there have only been a handful of really big shifts in money throughout history: We had barter, then either money then debt, or debt and then money. Anthropologist David Graeber (Debt: The First 5,000 Years) makes a case that contrary to conventional theory, barter did not beget money, but rather debt in the form of obligations came first. This was the first true abstraction of deferring present consumption into future value. Owing somebody something, whether it was returning a favour, or later, some symbolic representation of that favour, and that was the progression toward “money”. It’s a compelling argument. In either case, aside from subsequent innovations such as the creation of the banknote, which facilitated transmission of value at a distance, and double entry accounting, nothing much has happened in the structural shape of money since the last big innovation, which was the rise of fractional reserve banking. Everything since then, from various fiat currencies, to credit cards to the magnetic strip or PIN chips have been variations on a theme, the theme being debt is money. As long as the various modern welfare states continue to spend more than they receive, they have to keep creating and monetizing more debt in order to keep the wheels on the system as a whole. It’s Inelastic because as we all know there are only a set amount of coins that will ever be created. This is in stark contrast to the supply of money in fiat terms. As somebody jokingly tweeted the chart I included from Part 1 “Wow look at that bitcoin price! 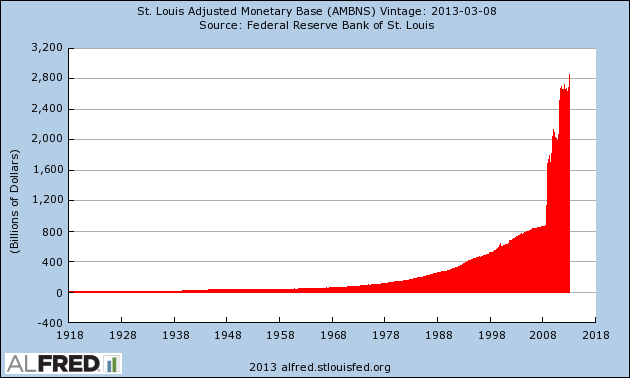 Oh wait, that’s the chart of the money supply” – more on this below. A deflationary currency is closey related to being inelastic, but we need to look specifically at the deflationary aspects of Bitcoin because conventional economic thought is that “deflation is bad”, and it is — if you’re using debt for money. The reason why is because debt-based money, enabled by fractional reserve banking allows monetary units to “exist in two places at once”, so to speak. When I first started thinking about and researching all this economics and history stuff, it was in the immediate aftermath of the crashing of the dot com bubble. It was then when I realized that I had no understanding of economics, or finance and ultimately, money. So I began a “deep dive” into these matters which continues to this day. One of the first books I read about it was Ferdinand Lips “Gold Wars”. 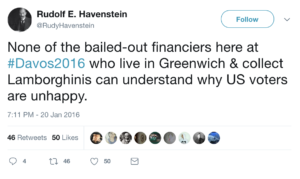 Lips, Swiss banker, and expert on the Classical Gold Standard was reputed to have been the cryptic and anonymous “Friend of Another (FOA)” financial and gold markets commentator of the late 90’s (foreshadowing of Satoshi Nakamoto?). My understanding of this today, is that Bitcoin is inelastic and thus deflationary. It has no counter-party risk (but there is consensus risk, but fiat has it as well), and it solves “the double-spend problem”. Fiat money, by contrast is one big double spend problem. The defining characteristic of inflationary debt-based money is mathematically and cryptographically eliminated under crypto-currency. 2) It leads to HODLING, or hoarding. The theory states that people wouldn’t spend any money today, because doing so would forgo the increased value the money would have tomorrow. The chart above depicts the trendlines of transactions in Bitcoin on easyDNS from 2013 to present. I haven’t put the Bitcoin price trend line in there but we all know what it looks like, if it were in the graph it would be a hockey stick with the inflection point starting around Jan 2016. We clearly see the pricing in BTC dropping as the price rises, yet the transaction volume and sales in CAD remain steady, with a moderate uptrend. It’s Transparent in two ways, first is the blockchain, where we can see the flow of bitcoin and all the transactions; and second the underlying code is open source. Contrast this radical transparency with, say, The Federal Reserve, which has an exclusive monopoly on the creation of money, creates it out of nothing and then lends it to the State and charges interest on it. Further, it is owned by a cartel of private banks and operates with no oversight. This is the crux of the current monetary era. For the longest time it was possible to dismiss criticisms of this system as “conspiracy theory”, but given that the damage Fed policies have caused to the economy, especially since the GFC is felt by all but a few, it is increasingly difficult to ignore this reality. Nassim Taleb, in his seminal work by the same title, invented the term “antifragile”, describing any phenomenon that gets stronger when it encounters volatility. The “imminent death of Bitcoin” is probably the one thing that has been predicted even more than the “imminent death of the Internet”, which was a popular recurring theme back in the late 90’s or so. Both technologies – the Internet and then crypto-currency are decentralized, largely open source protocol stacks that have transformed our civilization. These qualities make crypto currency something that is anathema to the previous paradigm’s debt-based fiat. As such, it poses an existential threat to existing incumbents, be they technocrats, banksters, career politicians, or complicit corporate cartels, whose position depends on their proximity to and relationships with the money centre apparatus that creates money and preferentially distributes it out amongst this network. When we ask ourselves this question we’re back to Graeber’s assertion that the entire monetary system is a control mechanism that uses debt to keep the wider populace in line. For a long time Keynes was right. Then, as the century-long debt super-cycle started to crescendo a couple of key events happened. The first was the Global Financial Crisis 2007-2009 and the purported “near-death experience” of the modern economy. Wall Street was bailed out, who used the money to give themselves bonuses, while the middle-class was decimated and continues to be ground into poverty to this day. There was incongruence in this picture, on one hand incompetence and financial recklessness was rewarded while the rule-following middle class were penalized. It was at this moment, that the Satoshi White Paper appeared on the scene, and proposed a different way to structure the monetary system. Nobody really noticed. 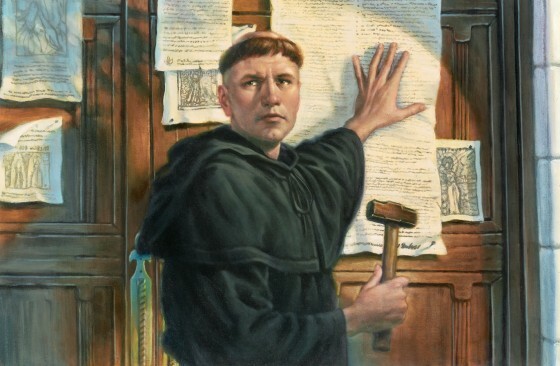 But it set off a chain of events as sure as Martin Luther’s “95 Theses” set in motion the secular decline of another hitherto undisputed hegemonic central power: The Catholic Church. In that time the result was The Reformation and the Catholic Church never regained its central power position. One document galvanized an entire movement, and the harder the Papacy pushed back on Luther to try to contain it, the faster Protestantism spread — there’s that antifragility again. Protestantism presented enough benefits to enough royal houses throughout Europe that when weighed against the authoritarian and decadent papacy, the upside to the new paradigm looked better than the old system – and that is precisely what it is happening, again, today, in the monetary sphere. For the first few years after Satoshi’s paper, Bitcoin didn’t really break into the public consciousness but the wheels were certainly in motion and those people who had a lot at stake and were coming to gain a visceral understanding of the hypocrisy and capriciousness, not to mention the destructiveness of the current monetary regime were paying close attention. This provision, originally from the Harper government has been reiterated under Trudeau the 2nd. But people do know what that means. Now it was clear – unless we owned a bank we were all pretty much on our own, and even worse, whenever those banks went off and painted themselves into a corner of insolvency, we were the ones who were going to have to make them whole. Banks are “too big to fail”, everybody else is expendable. “I had the thought that Bitcoin is like a hole in the wall of a burning building. The burning building is the petrodollar. The Bitcoin hole in the wall doesn’t meet any standard definition of a door. It wouldn’t pass a building inspection and it may not last long. It will most certainly be replaced by something else in the long run. But in the short term, no one inside that burning building really cares about any of that and the ones that first smelled smoke are already pouring through it. Many more will follow and some, sadly, will die in the fire. There are other exits from the building too, some may be safer than others, but the most important thing is getting out of the burning building as quickly as possible. And this finally brings us to what I think Bitcoin really is. It’s a type of capital / currency flight. In a way, (and I didn’t coin this analogy but I can’t find who did — update: it was Stefan Molyneux) all fiat currencies are experiencing a hyper-inflationary collapse against Bitcoin. It makes a certain amount of sense, the logical outcome for the vast monetary printing of the last century is an inflationary blowout. But that conjures up images of Weimar Germany and wheelbarrows full of cash, the recent Zimbabwe collapse or perhaps Brazil – where banks installed a second clock to display the value of your money eroding while you waiting in line, it all seems so unthinkable here. And yet, here we are with Bitcoin in a bubble, stocks in a bubble, bonds in a bubble, real estate – in a bubble, is everything in a bubble? Or are we experiencing a slow motion breakdown in the underlying fiat regime in a typically cavalier and nonchalant Western way? Not some James Rawles “end of civilization” novel but rather a mass exodus into anything perceived as “an asset” whilst Bitcoin surpasses them all because of a combination of inertia and the fact that’s it’s effectively an antidote to a global parasitic economic blight? Having said this, even if this were true, it doesn’t mean “the price of bitcoin will go up…forever”. Even true hyper-inflationary episodes themselves usually last about 12 to 18 months, after which a new currency regime comes in to replace it. What we could be seeing here are the early innings that usher in the end of USD as the world reserve currency and the beginning of “what comes next”. The fact that USD hegemony will eventually end is no surprise to anybody, even mainstream economists. However “eventually” has this vexing habit of showing up sooner than most people expected. What may be unique about this one is that we’re rare witness to a double faceted shift: the technology shift from a debt based fiat money system to a decentralized crypto currency regime; along with the demise of the prevailing currency regime. This Time is Different (Part 1): What Bitcoin Isn’t. I am absolutely delighted that someone is pushing back against the banksters and the governments that enable them. However, if bitcoin is finite and new people are getting in on it which raises the price for those already there–isn’t that the same effect (and eventual outcome) as a pyramid scheme? No, because the nature of a pyramid scheme demands (eventually) an infinite number of new participants to pay off the old. Thanks so much for your excellent insights on Bitcoin and also the issues with debt-based monetary systems in general. The first is Bernard Lietaer – author of Rethinking Money – How New Currencies Turn Scarcity into Prosperity and other books. I’ve seen him speak and his solutions make a lot of sense to me and offer much more support for society in general. His website is http://www.lietaer.com. Thanks again Mark for speaking out and sharing your thoughts. I appreciate what you are doing very much and hope that somehow we will find solutions to change things for the better. Great article. You are obviously struggling with the overriding issue of our times: How do we convince everyone else to give up debt-based money and go to some form of equity alternative? And, how to go about making the change after hundreds of years of the growth of a power structure committed to a debt-based option? I am the publisher of a book that attempts to contribute to the solution of that problem. 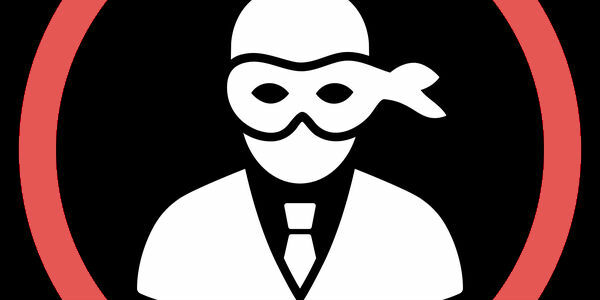 Thieves Emporium is a technically-accurate analysis of these questions delivered in the form of fast-paced fiction to keep the reader interested. I recommend everyone reading this post pass it on to anyone who has started to question the debt-monetary-matrix that we are trapped in. Or you could just buy a copy at Amazon, where it is rated 4.6 in 130 reviews (https://www.amazon.com/Thieves-Emporium-Max-Hernandez-ebook/dp/B00CWWWRK0) where I have kept the price low to encourage more readers. The problem of how to explain to a non-Austrian about the problems we face is one that we all struggle with and, given the collapse that is coming soon, one that we must win if we are to prevent the banksters from just giving us a clone of what we now have when the dust clears. Thieves Emporium is the best way I know of starting that process. Get a copy and start passing it around.